It’s almost completely dark shortly after 5:00 PM these days, and the temperatures are pretty mild for this time of year. These conditions made Thursday’s after work night ride just about perfect. 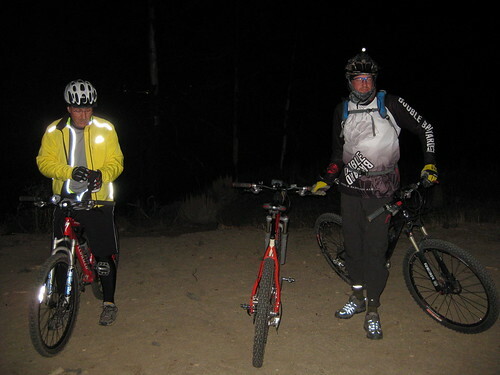 I had hoped to do more night riding in the summer, but by the time it got dark, I was ready for bed! You don’t have to wait long for darkness this time of year though. I rode home after work on Thursday, had a quick dinner, suited up, and then began my ride across town to the trailhead. The full moon has already come and gone, so the night was pretty dark. Without all the visual cues, I really had to pay attention to what street I was on so I could make the right turns. There were times when I wasn’t completely certain I was going the right way! The further I rode west, the darker and lonelier it got. I was looking forward to getting to the trailhead to see some other riders. When I arrived the trailhead, I could see a lot of riders getting ready for the ride, unpacking bikes and mounting lights. But without getting right in someone’s face, it was hard to tell who everyone was. I had to use voice recognition to ascertain who was among me! I was pretty certain the golden retriever with the blinking collar was LuLu though. After we all figured out who each other was, the eight of us headed for the Jackrabbit / Vicee Rim Trail. For reasons still unknown, Roger turned back. Lulu broke from the front of the pack to go find him, and shortly after, Lester got a text message from Roger saying he was done. We caught up to the leaders at the top of the 7 Steps trail, and met a group of three other riders on their way back from their ride. Before I could even see these other riders though, I heard the unmistakable laugh of Smiling Bob in the distance. I knew before I had finished climbing 7 Steps that we had met up with more riders. As we were talking to them, Mike showed up and brought our group’s number back up to eight. We descended to the Creek Trail, and then began our ascent up the canyon. I’ve only climbed the Creek Trail a handful of times, but riding up it at night was an all new experience! With only the bushes and trees visible in the lights, the sound of the creek off to the left, your imagination could put you just about anywhere. I was thankful to have the helmet light so I could look around! This was the first time I’ve used the helmet mounted light on the trails, and it worked out well; especially in combination with the bar mounted light. Even with the helmet light though, you don’t have peripheral vision like you do in the day. I had to really concentrate on pointing the light beam at the trail when the pace picked up on the downhills. Bringing up the rear, and having the camera stowed deep in my pack prevented me from getting good pictures of the experience. I got these pictures at the top of the Creek Trail climb. The photo taking technique was much different too. I just pointed the camera in the direction of the voices, pushed the button, and hoped for the best! As much fun as we all had, the ride ended pretty strangely. We were just a few feet from the trailhead, moments away from completing the ride, when we spooked a mother deer and her fawn. The fawn bolted, ran right into a wire fence, breaking its neck in the impact. The poor thing struggled for quite some time, but finally died. 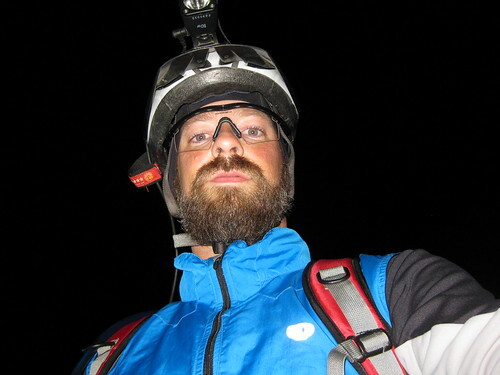 We all felt pretty helpless to do anything, and it put a somber mood on the end of the ride. 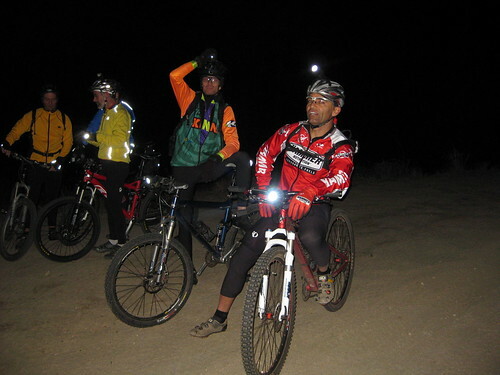 Regardless of this little tragedy though, everyone seemed pretty excited to get together for another night ride soon. So if you missed this ride, you will most likely have another opportunity very soon! A truly great group of riders and great to see so many bikes out at night. It looks like the coyotes removed the fawn from the trail. I think Dennis hung out a little and saw that it died. So at least it did not suffer too long. I also saw that Dennis had a new vest and pair of moccasins the next day. Coincidence? Yeah, he had me over for taco’s a few days later and come to think of it… they were pretty gamey…. behind the cool and calm front lies a savage!